Shivling connects a devotee with the Supreme Being – Lord Shiva. Here is a brief idea on how to worship the Shivling at home? There are no fixed rules of worship. You can be always flexible while performing the Shiva Lingam Puja. Regular puja items like diya, camphor, incense, agarbatti. The lingam is the symbol of Lord Shiva and the lingam puja helps the devotee in understanding Lord Shiva. The Lord cannot be described but still we say he is without a beginning and an end and is without a form. It is difficult for a devotee to understand this formless nature. Therefore Lord Shiva appeared in the form of Jyotirlinga before Brahma and Vishnu. The Lingam thus is a symbol of Lord Shiva. Each Lingam puja, step by step, takes the devotee to the eternal truth – that he/she is part of the Supreme Being. Before starting the Puja, the devotee takes a bath and wear freshly washed clothes. Hymns praising Lord Shiva or the mantra ‘Om Namaha Shivaya’ are repeated to create a mood for worship. Then, the devotee sits in front of the lingam and blows conch or ring bells. This indicates the beginning of the Puja. First, it is the 'panchamrit abhishek' - the libation of five holy liquids over the lingam. The libation can consist of any five of the following – water from river Ganga, honey, sugarcane juice, milk, yogurt, ghee, seawater, coconut water or milk, fragrant oils, rose water or other precious liquids. Usually, only milk of a cow is used. While pouring the liquid, 'Om Namah Shivaya' is uttered. Some devotees utter the Lord’s name 108 times and some 1008 times. There is no fixed rule. 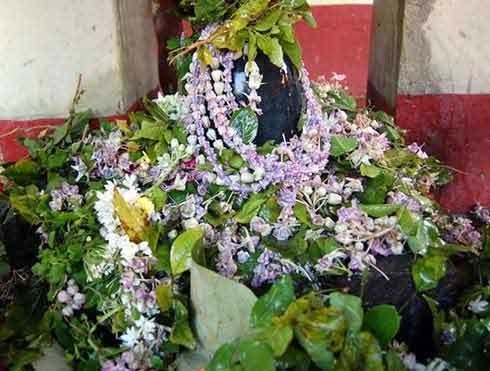 After this, the lingam is smeared with sandalwood paste and is decked with flowers. Water and sandalwood paste is used to keep the lingam cool, as Lord Shiva is always in a highly inflammable state. In some Shiva temples, cooling liquid constantly drops from pot hung above the Lingam. Next, flowers, sweets, coconut, and fruits are offered to the Lord. Diya, agarbhatti, camphor and incense are lit and ‘arati’ is conducted. Some devotees fan the lingam and sing praises of the lord. Finally, the ringing of bells or blowing of conch indicates the end of Puja. White ash (vibhuti) is rubbed on the forehead and it is also distributed.